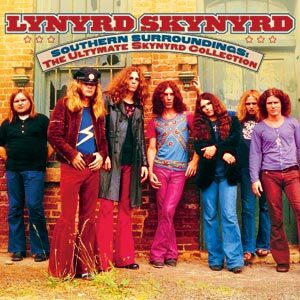 Lynyrd Skynyrd will release a 3-disc CD/DVD set, "Southern Surroundings," exclusively with Walmart, on Tuesday, August 7. The deluxe collection will include a CD featuring 14 of the band’s greatest hits, featuring “Sweet Home Alabama,” “Saturday Night Special,” “That Smell” and a live “Free Bird”; a seven-track DVD-Video from a live performance on BBC’s Old Grey Whistle Test, and a 10-song DVD-Audio/Video boasting 10 classic songs newly mixed in 5.1 surround sound by Grammy-winning producer Elliott Scheiner. The BBC DVD features live performances of “Double Trouble.” “I Ain’t The One.” “Call Me The Breeze,” “I Got The Same Old Blues,” “Every Mother’s Son,” “Sweet Home Alabama” and “Free Bird” from a performance originally broadcasted on November 11th, 1975. The DVD-Audio/Video disc showcases in 96kHz/24-bit uncompressed and 48kHz/24-bit Dolby Digital 5.1 surround sound, “Saturday Night Special,” “Gimme Three Steps,” “Swamp Music,” “Gimme Back My Bullets,” “The Ballad Of Curtis Loew,” “You Got That Right,” “That Smell,” “All I Can Do Is Write About It,” “Simple Man” and “Free Bird” (the complete, 10+ minute extended version). “Southern Surroundings” offers an overview of the legendary band’s career, both as a live act (which can be seen in the BBC footage) as well as a recording group, with the Scheiner-mixed 5.1 surround sound versions adding a whole new perspective to the group’s groundbreaking catalog. There are also some rare gems, including an acoustic version of “All I Can Do Is Write About It” on Disc 1 and a scintillating take on J. J. Cale’s “I Got The Same Old Blues” from the Old Grey Whistle Test on the BBC DVD disc.